Anyone else a RaCe DaY PrEvIew dork like myself? I realize we're all blogging gurus, and feel the need to capture a lot of (sometimes insignificant) pics on our running adventures (selfies, anyone?). Do you also feel compelled to lay out your race outfit the day (or evening) before said race? Or even for an especially significant training run (I'm looking at you, Mr. 20-Miler)? Well, I unashamedly admit to doing it. Care to hear the whys behind the madness? **It's a great opportunity to play with color. In case you cannot tell, I have a small obsession with color. I also have an artsy-fartsy brain, which means I can visualize how certain colors are going to play with (or against) each other. That said, setting everything out allows me to confirm all the colors are a go without the stress of doing it last-minute in a dark, early morning bedroom. **If something doesn't look "right," you'll have plenty of time to fix it. Even with my color know-how, I still have numerous running outfit fails. Again, it's much easier to make wardrobe changes before going to bed than with a cloudy mind the next morning, especially if you're pressed for time. The majority of my races are out of town, so I have to hit the road early to ensure I'll get to the start line on time. **You can give yourself options to allow for questionable weather. Have you ever stalked the weather, only to have it change every few hours? Rain? Snow? Bright sunshine? Having your gear ready to go (with potential inclement weather options at the ready) will give you peace of mind. **Don't forget the accessories! How about the Garmin? The Ipod? Fuel belt? Sunglasses? Don't just lay out the clothing, but add the must-have gadgets and gizmos as well to the mix. If you have everything all in one place, you're less likely to forget it. **It shows fellow racers what you'll be wearing. Most races also involve meet-ups with fellow runners...many of whom I've never met in person. If we all know what each other will be wearing, it makes it that much easier to spot one another in a slew of others at a crowded start line. **What about the race bib??? I don't always have the chance to pick up my race packet prior to the race day. When I do, though, I usually include it in my Race Day Preview so it's there with everything else and less likely to get left behind. A word of caution...if it's a big race (where the race bibs are at a prime), you may want to cover some of the bib number so it can't be counterfeited). **What if you cannot decide? For a Christmas-themed race last year, I had two outfits that I simply could not choose between...so I left it up to my followers (on Facebook and Instagram). Ultimately, they led me to go with the funky leggings instead of the Santa fur-trimmed shorts. **Don't ya just love a fun, holiday themed event? Even though I'm a warm weather fan, I do enjoy a winter race with a festive atmosphere. It helps one cope with the chilly temps, right? What do you think? Have you ever laid out your racing gear the night before a race? Any tips you'd share? 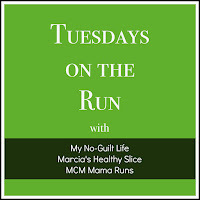 **I'm linking up with Marcia and Patty and Erika for Tuesdays on the Run. Ha - I love all your flat lays! Brilliant! I have never had an outfit issue apart from chafing or sliding (I bought some underpants with no side seams made out of a nylony, shiny material once, hoping they would be like Runderwear and v comfy. Well, I hope Runderwear doesn't interact with your shiny nylony leggings to leave them constantly sliding down ...) and I do often wear all black, but I really love your colourful and coordinated outfits and am in awe of the effort you put into them. I set out my clothes the night before all of my runs, but I only take pictures before big races. Also, if I'm staying in a hotel I'll include the accessories, otherwise I keep those in the basement and would't want to drag them all the way upstairs for a picture! I actually stalk what you are going to wear for a race on Facebook! Haha! I love planning and laying out my outfits and sharing them the night before my race too and I also try to make sure I don't repeat an outfit. I am currently on the hunt for some new visors in different colours just to add some extra va-voom! Those festive outfits have me thinking about the Christmas races too. I think I actually like the choosing of the outfits more than the racing itself! Lol! You certainly have a lot of running clothes to play with! I lay out my clothes the night before but I don't take pictures of it. It is a good way of letting people know what you're wearing, if you're meeting up with other runners. This reminds me I need to pack for Zooma...and Sea Wheeze...and charge the gadgets. Oh YES!!!!! Charging the gadgets is key!! I always try to lay out everything the night before (so often super early starts!). Sometimes I take a photo and sometimes I don't. It definitely helps when you have a meetup planned, though! I only do this for races. I have a standard kind of outfit I wear when running outside and there's nothing special about it. I do it for race day to make sure I have absolutely everything, and laying out the gadgets reminds me I need to charge things too. I always love your flat runner photos! I definitely need to do this more often as I'm sure it would make me feel less stressed the night before a race. I love holiday themed races that allow you to dress up. Too hot in the summer to be able to do that. I have been known to do my share of weather-stalking before a race. I usually go with my most comfortable bra, underwear, and outfit for race day, especially if it's a long race. I have a bright pink Run PA tank top that I love right now. It's fun dressing up (within reason) for races. Since I'm not an Olympian (with a career on the line), I figure why not have some fun, right? Yes I lay out my outfits esp for big races. Sometimes I post on IG. I always take flat runner photos! It helps me commit to one outfit and I think it's fun to lay it all out there. I have had to go back and reshoot when I've left something important out of the photo! And I like seeing others' outfits because it does help me find them on race day! I always lay out the clothes the night before, even for just morning runs that aren’t races. It helps me get out the door faster and it make it so I don’t forget anything! I love the race day outfit previews! We encourage them in our MRTT group as a way to cheer people on and give them that extra little confidence boost as well the day before. You have some of the BEST running gear :-) I do this for my big races and I do a trial run in it to see where I chaff, etc. I love your "artsy-fartsy brain" outfit previews. I put my race stuff out the night before, but usually just in a pile on my dresser!